A brush fire that broke out Friday evening along state Route 52 near Mission Trails Regional Park was still not completely contained Saturday afternoon. 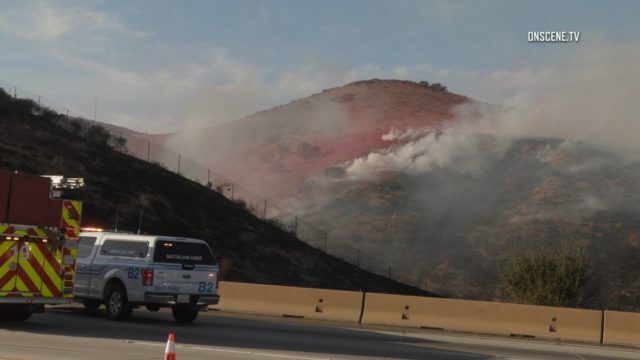 The blaze began spreading on a hillside next to the northern side of the freeway near Mast Boulevard round 4:30 p.m. Friday, according to the San Diego Fire-Rescue Department. The spread was halted at an estimated 21 acres by 6 p.m., and the fire was about 90 percent contained Saturday morning, according to San Diego Fire-Rescue spokeswoman Monica Munoz. Officials had expected to fully contain the fire by noon, but the official containment estimate was still 90 percent as of about 4 p.m., according to Munoz. The California Highway Patrol shut down three westbound lanes of state Route 52 while ground and air crews battled the fire Friday, but the closure was lifted as firefighters got the blaze under control that night. Personnel with Cal Fire and Heartland Fire & Rescue were helping San Diego city crews extinguish the flames. No structures were threatened by the fire.